Here are the step-by-step instructions to complete the application form for the 2019 Embassy-Recommendation MEXT Scholarship. If you’re signed up to my mailing list, I’ve already sent you a sample copy of this year’s form. If not, then you can get your sample copy by signing up here. I’ll also write you as soon as I have any new articles or resources about the MEXT scholarship available. In general, the form is much cleaner and easier to use this year, but there are still a few confusing areas, so here’s a step-by-step walkthrough on how to complete it! This article is about the application form for the Graduate-Level Scholarship Application. I have not reviewed the form for undergraduate scholarship applicants, but you can download it here if you are looking for it. 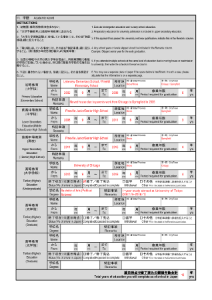 Even if you are filling out the form in Japanese, write all non-Japanese proper nouns (such as names, places, school names, etc.) in English letters. Do not try to write them in Katakana and do not translate terms into English. (For example, if your language uses words that mean “city” or “district” in addresses, write the original word in your language, in English letters, do not translate it to the English word). A note about check marks: In the sample form, I used a special character that looks like a checked box. This is from the font Segoe UI Symbol, which is standard with Excel. You can insert it using the “Insert symbol” command in excel. For more information, check out this article. 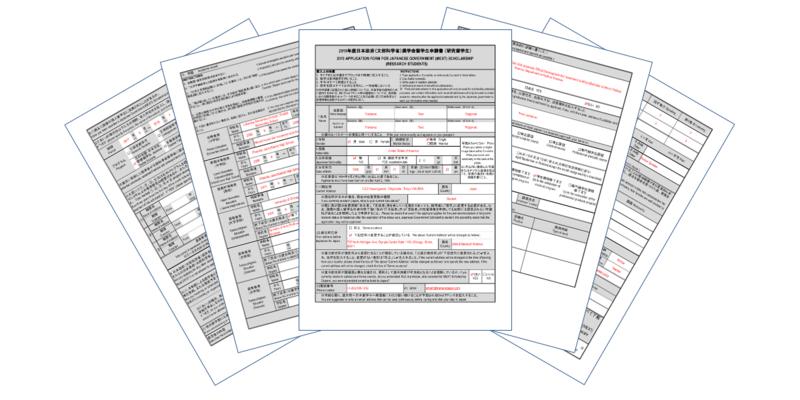 Click here to download a sample completed application form. Photo: Your photo must meet the dimensions specified in the form, be clear and no more than 6 months old, and show your upper body. You can insert a digital image directly into the form (insert photo) before printing or attach a physical photo afterward. If you decide to attach a physical photo, it must be printed on photo paper and you should attach it with paste or a glue stick. DO NOT use staples, as that will damage your photo and make it useless. 1. Name: Your name (especially in the “alphabet” line) has to match your passport, exactly. You do need to fill in both lines (to be safe), even it they are identical. In general, the “Native language” line should match what is written in the top half of your passport, near the photo. If your country uses a language other than English, or uses English with special characters, use the appropriate characters from your language in this box. Everything between the Country Code (USA in the exampe) and the “<<” is your surname. Everything after the “<<” is your given and middle name, in that order. It is your choice whether to list all of your given and middle names in the “given name” box or to split them between given and middle name, but you must include everything and cannot change the order, even if that’s not what you use in daily life. Yes, that’s a lot of instructions for a “name” line, but I’ve seen a shocking number of mistakes with this one in the past. 2. Gender: This refers to your biological gender, not your gender identity. Do not expect special treatment or even official acknowledgement of alternate gender identities in Japan. Individual people might by understanding, but institutions are not likely to be. Note: In Japan, your age goes up on your birthday. It does not automatically go up on January 1 or on the lunar new year as it does in some other countries. Your age at birth in Japan is “0”. I am aware that in other countries, newborn babies are considered to be “1” at birth, but use the Japanese system for this form. 7.(1). Current Address: Your address as of the day you submit the form. 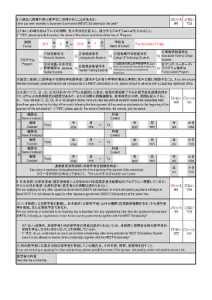 If you will move between when you submit the form and when you travel to Japan to start the scholarship (for example, if you will graduate from college and move home), you will fill in your address after the move in 7.(2). In the downloadable example, the applicant is studying abroad in Japan when he applies for the scholarship. (And, based on his address, he lives at MEXT headquarters). You would also use this line if you were living in a college dorm, etc. 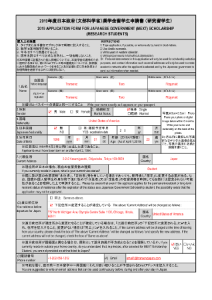 If your current address in is Japan, you need to fill out your current visa status (residence status), too. This is important for confirming how you conform to the eligibility criteria. In line (2), you want to check the box saying that your current address is your permanent address or fill your permanent address (e.g. Your parents’ address, etc. ), if you plan to move between when you submit the application and when you come to Japan. That way, MEXT and the embassy has a mailing address where they can reach you even after you leave the place you’re living now. You also need to acknowledge that you will not receive a plane ticket to Japan paid by MEXT if your permanent address (7. (2) or 7. (1) if you checked same as above) is not in your country of nationality. 8. (1) Past awarded record: The JASSO scholarship and MEXT Honors scholarship do not count for this question. If you are not sure about your past scholarship type, you can ask the embassy or consulate for more guidance. In 8. 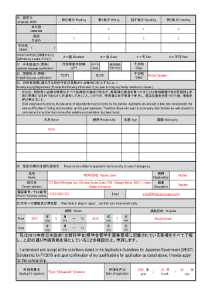 (2) fill in the start and end dates of your scholarship award and the name of the university in Japan. Then check the scholarship program in the section below. If you checked scholarship types 1, 2, 3, 4, or 6 in 8. (2), then you need to complete 8. (3) as well. If you checked scholarship types 5, 7, or 8, then you can skip to question 9. Your past scholarship award is not in conflict with receiving another award. In 8. (3), if required, you would need to fill in your research and education experience since the end of your last MEXT scholarship award. Typically, you would have to show that you have spent 36 total months enrolled in degree programs since your last scholarship award. Experience as a professional researcher should also be accepted. The “year” field in each of these lines is three cells wide, while years clearly have four digits. Feel free to combine the cells so that you can insert the answer correctly. For the purpose of this table, count the actual years and months you spent in the program or employed, not the “standard years of study” as we will discuss for the Academic Record, below. 10. 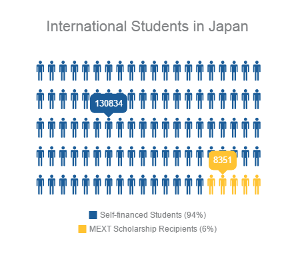 (1) Overlapping receipt of other scholarships: MEXT does not allow concurrent receipt of other scholarships, so you verify that you are not receiving other scholarships that will cover the same period as the MEXT scholarship or that you will withdraw from any others upon receipt of MEXT. 6. Attaching an Additional Sheet: If you attach an additional sheet because you attended multiple schools and cannot fit them in in the same column, then the additional sheet should include a full duplicate of the column you are replacing, with all fields. In that case, still include the overall start date, overall end date, and total years of study in the form, itself. Total number of years studied: When calculating total number of school years, you should include extended vacations as part of the year! Tertiary Education: Enter college or university undergraduate education in the first line and graduate in the second and third (if applicable). As in the example, indicate any study abroad in here, as well. Status (*As of Arrival in Japan): This entry appears for the tertiary education only. Check the appropriate box. If you have not yet graduated, you should check “Expected to complete” and fill in the expected graduation date for your graduation date and the total years you will have completed upon graduation. Degree: Fill in the name of the degree you have earned. You’ll also want to see when the semester starts for your preferred program(s) in Japan and what semesters it is possible to start your degree. If you don’t speak Japanese yet, keep in mind that you may be placed in a semester-long survival Japanese course for your first semester after arrival. Account for that semester in your plans when deciding if it is best to arrive in the spring or fall. You can also leave the choice up to the universities, if you do not have a strong need to choose one semester or the other. 17. Term you wish to study in Japan: This question does not guarantee that you’ll get the whole term you ask for – you’ll have to apply for each extension separately later. (More about that in a separate article) It does tell the Embassy and the Universities what your long-term plans are, though, so they have a better idea of your situation. If you’ve taken Japanese classes in undergrad, etc., but had no official test score, that would not count as a certification, but you can list it anyway (e.g. “8 semesters of Japanese language education”). Attach a copy of your test results to the application, if available. 22. English language qualifications: Similar to the question above, fill in your test scores for any official TOEFL (be sure to note the type) or IELTS test. You will probably be asked to produce the certificates from these tests when you apply to university. “Other” can include CEFR ratings, O levels, TOEIC, and country-specific tests like GEPT, but understand that those may not be accepted by all universities, so the universities may ask you to submit formal test results when you apply for a Letter of Acceptance. Attach a copy of your test results to the application. 24. Emergency Contact in home country: To put it bluntly, if you were to die in Japan, who should the university call to pick up your body and bring it home to your country? You want to sign by hand. A typed signature is never acceptable. Special thanks to the TranSenz supporters on Patreon. You can show your support for TranSenz on Patreon for as little as $2 per month (or less than 0.15% of the monthly MEXT stipend). Patreon supporters are instrumental in helping to cover the costs of maintaining this site and get priority responses to any questions as well as advance access to news and offers. You can also find dozens of questions and answers in the comments of the original article and the article I wrote about the 2018 Embassy Recommended Application Form. Interested in Learning How to Maximize Your MEXT Scholarship Chances? 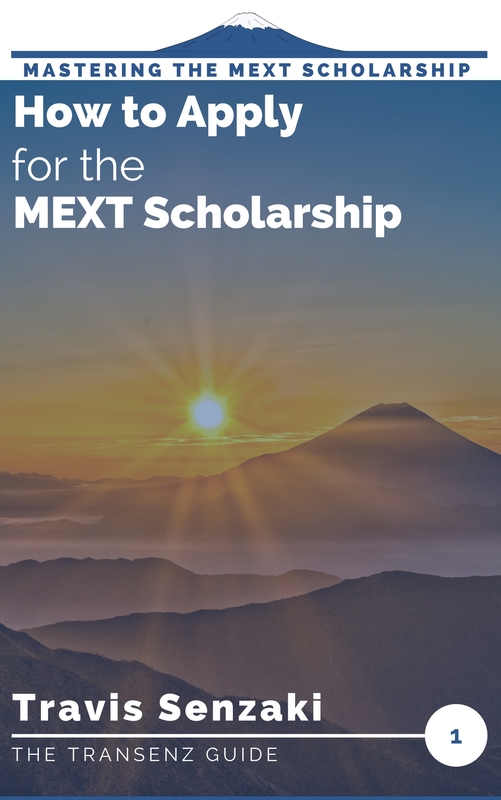 My ebook, How to Apply for the MEXT Scholarship, is designed to help you understand the scholarship and its purpose from the reviewers’ perspective, master the successful applicant mindset, and develop an application strategy that will give your application focus and give you the highest chances of success. For more details and a list of ebok retailers that carry the book, click the image to the right! My name is Phillip Muzembe from Zimbabwe and I want to apply for undergraduate scholarship I’m interested in business administration. Please help me with the information. Do you have any agents here in Zimbabwe. You can contact me on WhatsApp Or email. I do not have any agents, I am just me, writing this blog with as much helpful information about the scholarship as I can find and put together. I hope you will be able to find the information you need in the dozens of articles and guides that I have already posted. I do offer a limited, paid, one-on-one coaching service for additional assistance, but you will get more out of that experience if you already have a baseline understanding of the process and what you want to do. thank you for this detail procedure. I have another question regarding MEXT Mark sheet form. how can i list all my grades in such a small form. shouldn’t i only attach my DMC (detail mark sheet)/ transcript) just? my institution only issue certificate indicating your FINAL CGPA converted to percentage as per their criteria. Is that enough? I saw that you had asked the same questions in a separate comment and answered them there first. Your articles are extremely helpful. Thanks for uploading them. 1. my bachelors transcript/detail mark sheet has above 35 subject and how can i list all my grades? 2. my university only issue a certificate in which they only show the final CGPA converted to percentage. Is it good enough? The guidance you referred to appears to be specific to your country – it is not something I have seen in MEXT’s documentation before, but I was able to find a copy on the Japanese Embassy in Pakistan’s website. 1. It appears that you are only required to list your overall marks/GPA/percentage for each earned degree on this sheet, not your course-by-course grades. 2. According to the requirements on this sheet, that is exactly what they are asking for. However, you may later need to submit documentation showing your grades for each course taken (unless Pakistan has a special process for the evaluation). 3. You have to complete this form and also separately submit attested copies of your transcript and degree earned at your most recent university. I would recommend including both the detailed mark sheet and the CGPA certificate. Thanks for your effort and patience in keeping up this wonderful website. I am applying for a University-recommended MEXT scholarship under Professional Graduate Program (MBA), and my undergraduate degree was in Electrical & Electronics Engineering. Does this count as a “related field”? I have 6+ years of work experience. Under “Field of specialization studied in the past”, is it mandatory that I write about my undergraduate program, or can I write about my work which ties very closely with the field I am studying in Japan? It depends on what kind of research you did as an Electrical Engineer and what exactly you plan to focus on in your MBA program. The relationships between the fields is not the relationship between the degree names, but rather what you, personally, plan to research. If you can find a way to link your MBA focus to the field of electrical and electronics engineering, or if you had a business focus in your previous degree, both of those would work. In the Field of specialization studied in the past, you are required to write about your degree program, not your work. If you took any business courses or did any work related to business applications during your degree, then I would recommend emphasizing that! Thanks Travis! This provides a lot more clarity to the question. I´m applying for the Japanese Studies scholarship and haven’t been ably to find a lot of information on how to fill out the forms, so I was hoping you might be able to help me. I also have to hand in my application tomorrow so I´m probably too late to get an answer by then, but I´ll try anyway! When applying for the Japanese Studies scholarship, you can choose either the (a) course which focuses on culture or the (b) course which focuses on language by checking one of two boxes. However, I would like to choose by university rather than course. Do you have any idea if it´s okay to check both boxes? I don’t know if this will be in time, but I hope it can help. I would recommend that you look at the courses offered at your first-choice university, determine which category they fit into, and select that category. 1) My school issued me a statement of result when I graduated but plans to issue a certificate when she holds her convocation later in the year (graduation certificates can only be issued during convocations). Question is: Can I use the statement of result when applying for the scholarship? Or is it a must to use the graduation certificate when applying (which means I might miss this year’s application process)? 2) Regarding the application, it’s stated that we should submit our original documents and they will not be returned. In my country (Nigeria), students are only issued a single copy of each credential. As a result, submitting original documents to MEXT is tantamount to letting go of one’s credentials. As a result, I intend submitting coloured photocopies of these documents. Am I safe? 3) A successful scholar from my country stapled his documents together (attached/supporting documents) ditto his passport. However, you made mention of never stapling the passport and instead use glue. Please, with your experiences, which do you recommend (including attachment of supporting documents)? Additionally, how will the embassy’s officials ditto MEXT know if my details are written at the back of the passport if I glue it (passport) to the document? 4) Regarding contacting advisors, is it appropriate to build-up a relationship with them before the application process commences and make no mention of applying for the scholarship? That’s, I intend communicating with academic supervisors before the application process is open so I could confidently choose three supervisors on the placement form and contact them for LOA after passing the primary screening (hopefully)? Once again, I’m sincerely grateful for your writeups regarding this scholarship program. 1) If the statement of results is an official document from your university and confirms that you have completed all requirements for graduation, that should be fine. You do not need the actual diploma. 2) You should submit certified copies. A simple color photocopy would not be accepted, but if the copy is certified as being accurate by a university official such as the registrar (preferably) or by a notary (if your school is not willing to do it), that would be considered acceptable as an original. 3) Avoiding staples is not a “must” just a highly recommend (trust me, university admins and other staff hate staples). However, you must not have any staple holes in your photo, because that would make it useless. I recommend using paperclips to keep documents together, and never attaching two different documents to one another. Only the photograph should be glued to the application form. The point in having your details on the back of the photo is that if the glue weakens and it falls off, they will know which application it belonged to. This happens a lot! If the photo doesn’t fall off, then they aren’t going to check if your details are written on the back or not (unless you submit an extra photo, as I recommend). 4) I absolutely recommend building a relationship with professors in advance. You do not have to keep it secret from them that you plan to apply for the MEXT scholarship, but I recommend that you do not bring it up until after you have established somewhat of a relationship. I would certainly suggest telling the professor around the time that you apply – or before, if you are close enough that you feel comfortable asking them to review your Field of Study and Research Program Plan. Thank you very much for such a detailed post about application form! 1) Since first we need to send the documents by e-mail, in which format is it better to send the application form? Excel or print out and then the scanned version? Or maybe pdf? 2) I did not understand how to add an extra sheet since all of the free areas in grey color and I cannot get rid of it 🙁 Also, if I will add the part of Upper Secondary Education as an extra sheet, I will still have the same row height in Name line or I can change the height in this case? 3) Should I indicate in the Remarks that I successfully passed the entrance exam to enter the university (undergraduate) and got state scholarship? 1) There is a signature block on the last page that would have to be signed by hand, so you would have to print, sign, scan as pdf and send it. You might want to include an excel version, too, with your scanned signature pasted in, if you can do that. 2) You would have to create an extra sheet in a separate word or excel file. Design something yourself that matches the table format from the MEXT application (or make a copy of it, if you can). If you are adding an extra sheet, the format does not have to be exactly the same (row height, etc. ), as long as it is obvious what you are trying to do. 3) I would recommend that you mention the state scholarship in the remarks, that sounds like a mark in your favor. About the entrance exam, isn’t that something everyone would need to pass? If it distinguishes you somehow, go ahead and include it. Thank you for your precious blog. I have a question though. Should we fill out the form in red text? No, you should not fill it out in red – I did that in the sample form just to make it clear what parts were my own sample entries and what parts were part of the original form. Sorry for the confusion! I am going to apply for MEXT UG in April 2019 and I will complete my diploma in Mechanical Engineering in JULY 2019. What should I submit as Graduation certificate? I’m afraid I do not know enough about your education system (or indeed, which country your are from), so I cannot give you a precise answer, but you should submit a certificate that proves that you have completed Secondary School. (Typically an 11- or 12-year education). If your Diploma in Mechanical Engineering is something you completed on top of secondary school, then I would recommend submitting your completion certificates for both. I have completed my 12 year education in 2015. And I enrolled in Diploma in Mechanical Engineering (which is equivalent to 12th standard) in 2016( 1 year gap for preparation purpose). According to application guidelines one has to submit graduation certificate during submission of application form. But what should I submit as my diploma certificate if I am going to complete my diploma in Jul2019( After Apr 2019 and before Apr 2020)? Can’t I submit a letter writing by my teacher that I will complete my diploma before arrival to Japan? Thank you for confirming! The system you described sounded like India’s but I couldn’t be complete sure! I’m not as familiar with the undergraduate scholarship as I am with the graduate scholarship, but I know for the latter one, you would submit exactly what you suggested. Typically, the letter would be from the school registrar or whatever office it is that has authority over your course progression and graduation date. Hey transenz ! I’m worried nd little confused in filling mi application form on excel according to ur given sample paper !as far as concerned of application form you gave a link of excel .and what about other forms like as mark sheet ,placement preference form and research plan ? Is it fill with hand written form ? Plzz reply fast . Have shoratge of time in deadline .thanx in advance for your help nd apology if i’d say something wrong etc . If someone read mi comment first from blog before transenz brother nd knew the answer . Please help me with rply ! Sorry Vickyy, your comment does not become visible to anyone else until after I have had the chance to review it, so nobody could see it until now. The placement preference form is also an excel form and the field of study and research program plan is a word document. 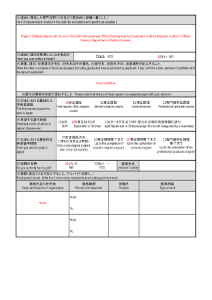 You should be able to get the original forms from the embassy website and fill those in digitally. Documents like the Marks sheet are official documents issued by your last university. I am applying for Undergraduate MEXT and have a question about “Period required for graduation” form in Tertiary Education section. Trouble is that my degree program requires an odd number of semesters during study at university, what in total is 5 full years and a half. Also, as of arrival in Japan I will have finish 2 full years and a half of my university program what in total is 13.5 years of education. So how am I supposed to fill those “Period required for graduation” and “Total years of education you will complete as of arrival in Japan” forms? Is it fine to fill forms with fractions like 5.5 or 13.5? And another question. Should I fill “Degree” form if I am going to withdraw from university to before finishing my degree? In this year’s form, the question does not ask how many years you took to complete the program, it asks how many years the program normally takes to complete. So, if it is normal to complete the program in 5 years, but it took you 5.5, then you would write “5” for the period required for graduation and explain the difference in your situation in the remarks. If the program normally takes 5.5 years, then write that. If you are planning to withdraw from your degree, then I would recommend that you do not fill in the degree section and explain the withdrawal in the remarks. In that case, you should write your name as it appears on your birth certificate or another official government document. I would also recommend that you start applying for your passport, too! I’m writing for clarification on a few questions, and to also express my thanks for your detailed explanations on this site. All of your pages here have been incredibly helpful. 1), I attended a junior college before attending a University, and I also participated in a study abroad. Should I try to list all of that information in one section, or should I just fill out a new section? 2) I’m fairly positive that the university I’m applying to has the 6-month language acquisition program, and I know my Japanese will definitely need it. Would this affect the section for MEXT scholarship plans, and should I select the “research student” instead of “master’s degree’? Thank you again, I greatly appreciate your time and hope to hear back from you soon. 1) You would have to list your junior college and bachelor’s degree information both in the first tertiary education block. It should work to use the same method I suggested for listing multiple schools for moving, etc. : Fit it in the block if you can or add an additional sheet if you cannot. For your study abroad, that could go in the remarks section. 2) The six-month language program is available regardless of the university you attend. Ultimately, it is the university’s discretion whether or not to place you in it, not something that you deliberately apply for. The university will likely place you in that program unless you are fairly fluent in Japanese, but you do not need to change your application to account for that – it’s still fine to say that you want to apply for the Master’s program, if that is your preference. Ultimately, it will be the university that decides whether to place you in the degree program directly or start you as a research student. (Typically, I recommend starting as a research student, unless you have some particular region why you need to finish your studies faster). I’m applying through embassy in my country. I have everything completed except for the form where I have to indicate my supervisor and 3 choices of colleges. I reached out to 3 and 2 didn’t accept, one said he’s retiring next year and won’t be able to supervise fully. What do I do? I recommend you search for new professors. 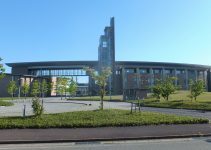 I recently wrote an article about how to find universities and professors who teach in your field in Japan that should help. Hello. Please!! I need help with 7(1) the question that starts with “if currently reside in outside your home country” and also with 10(1) “if yes, do you understand you must cancel” should I tick yes or no, knowing that I live in my home country and I haven’t applied for any other scholarship. Thank you for this amazing blog. Keep up the good work. You should not need to fill out an answer to either of those questions, since they do not apply to you. In the MEXT scholarship application for Indian students, i have filled the “course applied for as: Masters” and not research…..does that mean I will have to give univ exam as soon as I reach there or can I take my time ???? If you apply directly for the Master’s degree they you would most likely have to take the entrance exam before arriving. In some cases, the exam may just be a document screening, though. If you want to take the entrance exam after arriving, then you should apply as a Research Student. And I guess for the embassy I would like to become a Japanese translator or interpreter. One major question that I’ve been wondering is where do I take the test and when? Also, what is it like because I have seen the past test and they look a little daunting especially the math, because I don’t remember exponentials and trig.? I will be writing an article in the near future about creating an application strategy that will help you improve your chances, and there is also a lengthy chapter on exactly that subject in my book, How to Apply for the MEXT Scholarship. (The book is focused on the scholarship for graduate students, as are all of my articles, but the strategy section should still be helpful). If you are subscribed to my mailing list, I will let you know when the article is ready. The tests come after the document screening, before the interview. The past test should be a good indicator of what you will have to pass, if you are applying for the undergraduate scholarship. For the graduate scholarship, you will only take the Japanese and English language exams. Hey transenz ! What if i’ve got homeschooling of elementary school untill middle school . So i’ve no certificate tho ! Can yew please briefly clear to me either it is affected to mi application or not nd in that case what should i do while i’ve no certificate at all . Waiting for ur rply . In most cases, there is no such thing as a certificate for elementary or middle school, so missing that should not be a problem. As long as you have the certificate from high school and college, there should be no problem. Just explain in the appropriate section that you were homeschooled for those years and write the number of years. I’m almost done filling up the form but I have a question on point 11. If I cursed one year of my university abroad as an exchange student but my grades were all given by my home university, do I have to also write the name of the school where I cursed that year or is it enough to put the university from which I graduated from? If I have to add the other university too, would I write the years separated or count my 4.5 years of bachelor as a whole for both schools? I would recommend that you write the name and country of the school where you studied abroad in the remarks section and fill in the total years required for graduation. If your graduation took longer because of the study abroad year, mention that in the remarks, too. hello. i love your website, it really help me very much. i have two question about the application, my deadline for applying is may 29th so i hope you will answer soon! 2. at the end, the section ” date of application “, is it must be the day that i send that to embassy? or whatever day? i’m sorry because my english is not good. I’m sorry I could not get to your question earlier. I answer all of these in the order they arrive. Unfortunately, the undergraduate scholarship is not my area of expertise, so I can’t be completely certain. 1 – I would recommend filling in the program with the end date and period required for graduation as if you were planning to complete the whole thing, then write in the remarks that you plan to leave your degree there to come to Japan. You will need a good explanation why you plan to give up on a degree that you have already half-finished. 2 – It does not have to be the date that you submit the application to the embassy. It can be, or it can simply be the day you finish filling in the form. Thanks travis for putting this together. But i want to ask concerning the English Language qualification for those who do not have TOEFL and the likes. Will we be considered for the scholarship even though English is our offical Language?. Thanks. Language proficiency tests are not required for the Embassy Recommended MEXT scholarship application. You will take a language test at the Embassy later in the application process. However, some universities may want to see TOEFL scores, etc., when you apply for the Letter of Acceptance. In that case, they may not accept “English as an Official Language” as proof of your language ability. For the University Recommended MEXT scholarship, I know it would not be enough. Thank you so much for this! I had started filling out my application yesterday and this post came at the right time! I have a question though. In the “Field of specialization”, do I write only my thesis title? Should I elaborate on it? Also, where it asks about have you ever written a thesis…I’m currently writing one so I’m not sure what to choose! Do I say yes and mention below that it’s not published but I’m writing it or do I say no? For the field of specialization, I would recommend mentioning your thesis, but you also want to make sure that you write that entry so that it relates to the field of study that you want to pursue in Japan. One requirement for the MEXT scholarship is that you have to study a field that you have majored in in a degree program in the past or a related field. This question is where you want to make to make it clear that you have experience in a related field, if you are not pursuing the same field of study. When it asks if you have ever written a thesis, I would recommend saying yes, but being clear that it is in progress and mention the expected completion date. Thank you so much, Travis! I was really unsure about these section so this helps a lot! You’re a life saver.